Wash apples and dry thoroughly. Insert a wooden skewer in stem end of each apple. Spray plate with cooking spray. In 2-quart saucepan, mix sugar, corn syrup, milk and salt. Cook over low heat, stirring constantly, to 230°F on candy thermometer or until a few drops of syrup dropped into cup of cold water forms a soft ball that flattens when removed from water. Remove from heat; stir in vanilla. Cool slightly. Quickly dip apples into caramel, swirling until completely covered. Dip bottoms in candy sprinkles. Place apples on plate until caramel is set. Is there a fall treat sweeter than a caramel apple? This old-fashioned Halloween treat has certainly not gone out of style. It still makes a perfect snack or a sweet party treat and not simply for reasons of nostalgia. Take one bite of a tart, firm apple coated in thick gooey caramel and studded with nuts or candies and see for yourself why we make this caramel apple recipe every fall. 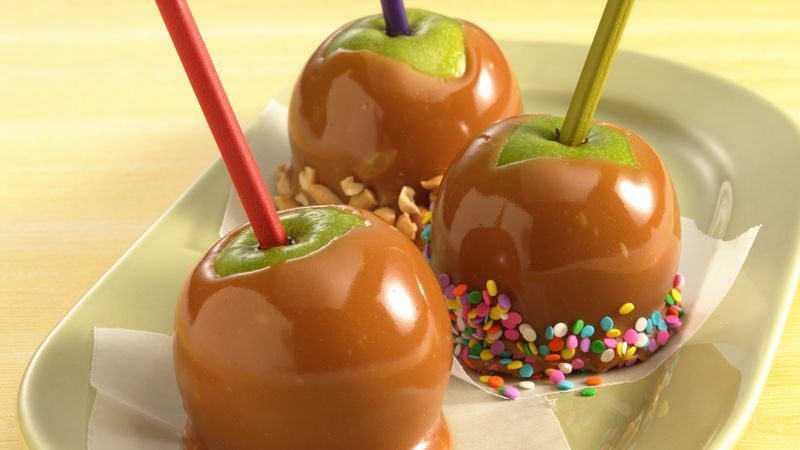 If you’ve never made caramel apples before, we’ve got tips to get you started. But it really is easy enough, so long as you’re ready to stir and have a thermometer handy. Plus you get a chance to expand your kitchen expertise, as this recipe calls for a scratch caramel sauce. Once mastered, we promise this sauce will come in handy. Maybe atop a warm caramel apple cake or another one of our apple recipes?